About a year ago, my daughter went to a Bethel Worship conference with some leaders in our network. When she came back, she had this sparkle in her eye. You could call it Spirit-Energy, a mirror into the stuff of heaven. She had experienced the presence of the Holy Spirit outside the walls of the church. She had seen Jesus speak over his people in a whole new way. She had a transforming experience with the Prophetic. I’ve raised this child I’m about to send to her first year of college in a denomination that is Teacher/Shepherd heavy, if not nearly exclusive. Our mainline approach to defining church traditionally begins with an emphasis on learning and ends with feeling management. It’s not all bad…one wonderful thing about a T/S Church is that orthodoxy and education are both held in high regard. How you feel and what you are thinking about are ranked pretty high on the spiritual scoreboard. Mainline approach to defining church begins with emphasis on learning, ends with feeling management. But that’s also the danger with isolating the T/S gifts; feeling and thinking become the metric for measuring spiritual growth and missional transformation. Seeing God move history forward through the work of the Apostles; Hearing the voice of God moving and shaping fellowship through the Prophets; Dancing to the rhythm of the evangelists’ proclamation, watching them making space for people to join the movement, those things are relegated to books…videos…and conferences. Take a moment and listen to my daughter’s experience with the Prophetic for yourself. Dylan Worship Story from Chris Harrison on Vimeo. In a recent video, I commented on why I believe that we are not seeing the APEST gifts, specifically prophets, thriving in the full five fold way they have been created to. I want someone to tell a story like that in every church on every day in every language. The Church must experience God through the prophets in every aspect of Christian life. Re-play the video. She was hyped to hear from the Lord! It makes what we teach, tangible, and those we comfort, filled with peace. If you have prophetic gifts, let me ask you: Are you engaged in a church where there are only prophets? Or are there non-prophetic people as well? Would you create space to share your gifting in the larger body of Christ? As in go to a church without prophetic gifting at this time? Prophets, without you, the body of Christ runs the risk of drying up and blowing away without experiencing the living stream of Spirit that flows through your obedience. If you are a church leader, let me ask you: Is there room in your church for prophets to operate as they are led to? Do you know any prophetic leaders that you could invite into your ministries and integrate in ways that bring life to the people of God? We need to hear the word preached and we need to be comforted in our sorrows, but we also need to be challenged in our faithfulness and encouraged in our spirit. 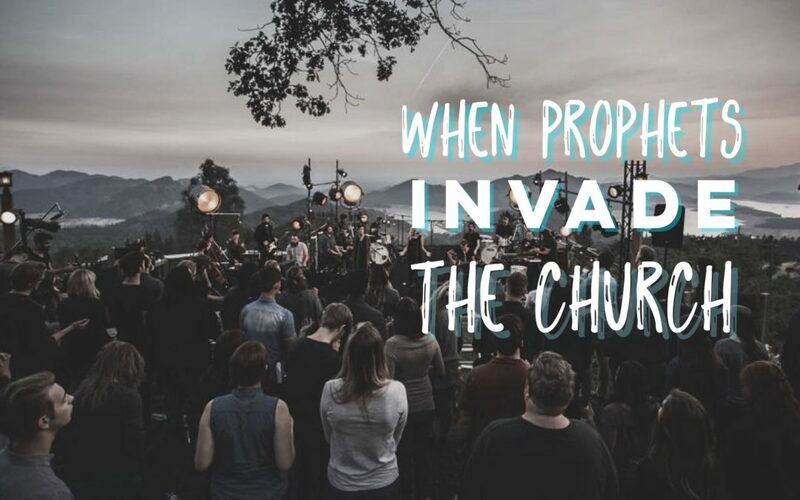 Prophets, it’s time to invade the Church. Imagine what the Kingdom of God on earth will look like when every follower of Jesus has a testimony like the one you heard above! For a fantastic introduction to APEST and the Five Fold Gifts, check out this post from Alan Hirsch on the new 5Q Central website. If you would like to leave a comment, we would love to hear: How are you seeing the prophetic gifts exercised in the Church? What ideas do you have to make room for prophets in the mainline denominations that have become mostly Teacher/Shepherd led?